Even with popular trends like bright neons and colour-blocking, I've always been one of those people who admires the look on others but rarely wears them herself. So for the Lise Water 40th Anniversary Celebration, I decided to finally tackle print mixing. Yes, I am aware that I am totally late to the party, but should we really surprised? Anyone remember my first foray into maxi dresses? Nice combination! Love the print on the kimono! This outfit is lovely! The two prints look great together, especially since they're both pretty calm. And of course, black and blush pink is always a good combo. Seeing the way you style a kimono really makes me want to get one. One of those things that looks like it would be tons of fun to style. My kimono wrap collection has grown exponentially in the past 2 years. I love them! You look so pretty here Alison! Really love the floral print of your kimono. I absolutely LOVE your mixing of print. seriously..perfect! and such a soft and feminine color palette without being frilly! Gorgeous dress. I like the colors and dainty little details. I'm so glad you decided to try the mixed prints trend because you did it so well. The contrast in colour and the different sizes of prints on the dress and the kimono compliment each other so well. Love it! 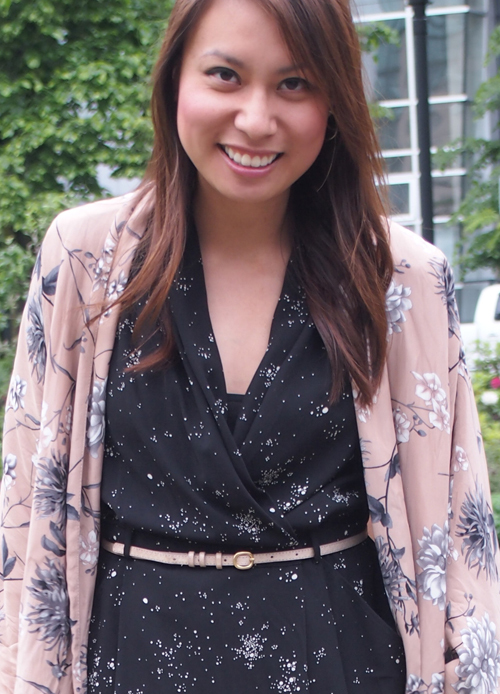 I've always been a fan of that Zara kimono and it pairs beautifully with the subtle print on your dress. I think it's great that you don't jump on a trend just because it's popular; you have to wear what you like and what fits in with your style, and you do it well! You did it beautifully - I love the first picture especially. nice blog i love your style!!! Oh my gosh, I am in love with your kimono! I have been looking for one for a while now! I am going to go check Zara out!! Looks great! I think the neutrals tie everything together. Love it! Sometimes it takes me a while to get around to trying things too, life is just too busy! I do love your printed dress and kimono together, gorgeous! Everything is well put together! Great outfit! I normally don't mix different prints either but I love how you do it here. The black and pink contrast beautifully and actually works well. The mix of prints in this outfit is so spot on. Love it. That's exactly how I feel about trends! I actually recently wrote a post on it too. Don't know if you're interested but I have a little giveaway running on my blog at the moment... it's my very first giveaway so don't judge me lol. Anyways, what I wanted to say was that I really like your blog. I just started following you, keep in touch. I love this outfit! I meant to mix prints too, but don't have any idea on how to wear it. Thanks for the inspiration! I Love that kimono... so pretty! Mixing prints is a risky task but, you pulled it off beautifully!